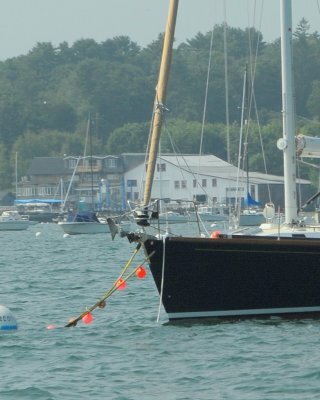 *****Our boat was hit to the tune of $25k in damages while on her mooring in Falmouth, ME back in 2005. 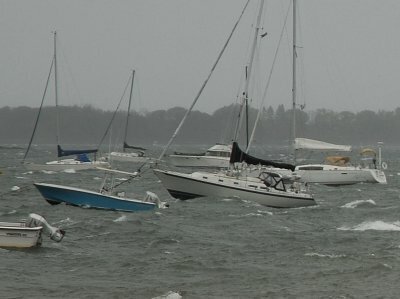 This was a freak wind storm that came from out of nowhere and the winds for that day were predicted to be under 5 knots. We were hit due to sloppy mooring etiquette on the offenders part. *****Since I was young I have studied mooring failures because our boats used to be moored in a very unprotected anchorage so it benefited me to know what caused the failure. Through hurricanes, Nor' Easters and many un-named storms we never lost a boat but many around us did. 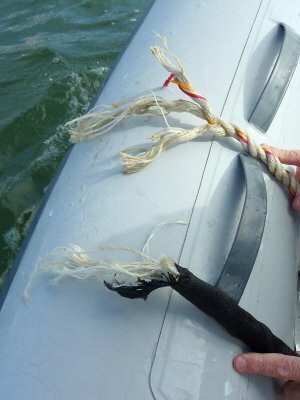 This blog is a photographic based editorial about how I see mooring failure modes. 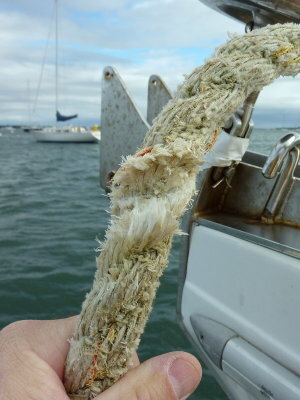 Anchors left on the bows of boats during rough weather can be a MAJOR contributing factor to chafe as can many other aspects. Well before I got a digital camera I would inspect grounded boats after a storm and when I would pull the remaining pieces of pendant through the bow chock they often lined up with the anchor. 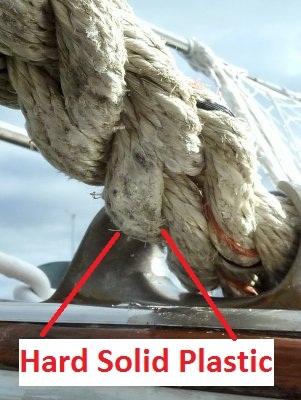 Chafe is often attributed to the bow chocks, which definitely happens quite often, but I have YET to see even one organization, magazine or "expert" talk about anchor chafe. Sad really! 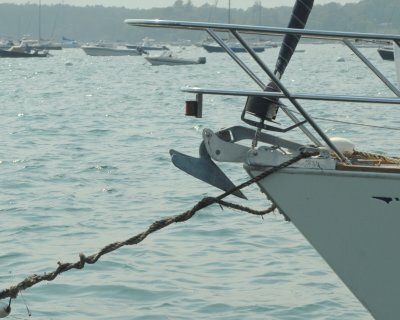 ****I am not going to sugar coat it, my goal is to get the town of Falmouth, ME and others to prohibit anchors on bows during periods of rough weather or at least add strong language to deter the potentially dangerous practice. Hopefully, with the photographic evidence posted here, word will pass around so people remove anchors WITHOUT being forced or asked to. This Island Packet still has both mooring pendants fully intact. One of the two anchors however has broken free and is chafing the pendants. 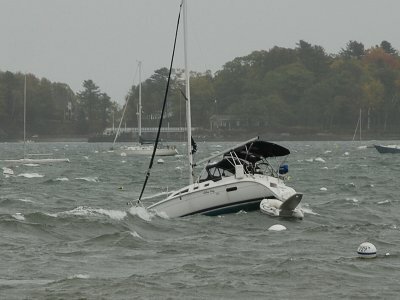 Some of you may remember my rantings on various sailing boards about folks leaving anchors on their bows, in exposed mooring fields, during rough weather. 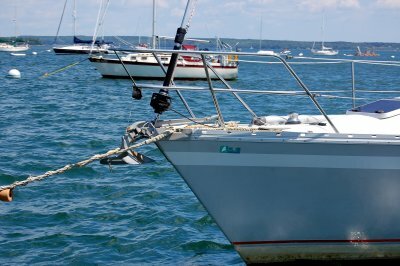 If your mooring field has the fetch to build waves that can pitch the bow of your boat enough to impinge on the anchor then it can be a rude & inconsiderate practice to the boaters around you, who may get hit by your drifting boat if you do not remove your anchor when a blow is expected. 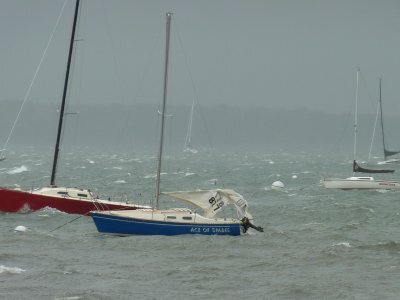 Many times chafe comes from the chocks but after motoring around the anchorage the morning after this short storm I saw that most of the chafe was anchor related. 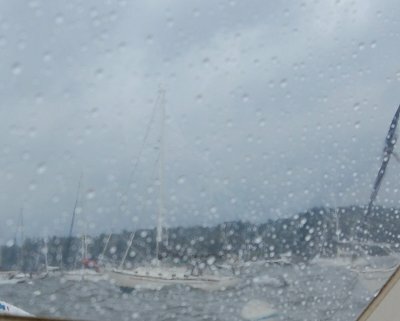 For some time now, I have been trying to capture the "moment" on film to really drive the point home about removing your anchor from the bow if a storm is coming. Some folks actually get it and can visualize the impact their anchor may have on the pendants, but many still don't. I think this Island Packet is a prime example of "my anchors are protected by a bow sprit, I don't need to remove them" line of reasoning. 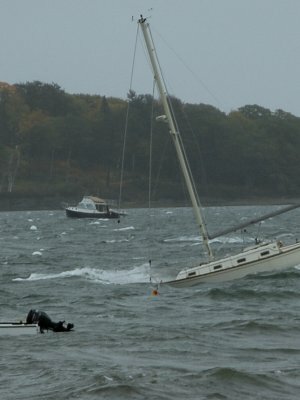 This owner likely had no idea his or her boat could pitch this much in Falmouth, ME. This was not even one of the bad storms we've seen. 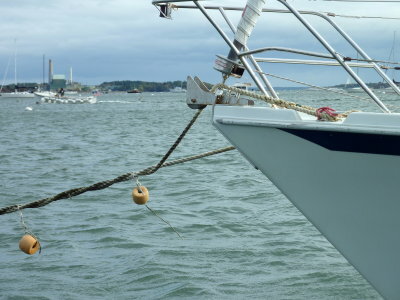 In my opinion any anchor than can interfere with any pendant in rough weather has no place remaining on the bow of a boat. 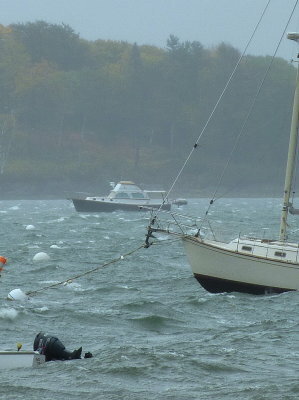 This storm saw 3-4 footers rolling through the Falmouth mooring field on 10-14-2010. This is what just 3-4 footers will do to a 30+ foot boat. The sprit of this boat was literally diving under water as she crested a wave then dove into the trough. During one of these dives she caught one of the poorly secured anchors, a Delta, that was left on the bow sprit and hooked it with one of the pendants thus ripping it free. I was using my Nikon D-200 that shoots 5 frames per second to try and capture the "moment". She went down with two intact pendants and came up with only one. In this photo you can clearly see that one pendant has chafed and parted. If this vessel had only been secured by one pendant she would have been officially adrift. This set of images makes a strong case for dual pendant use! 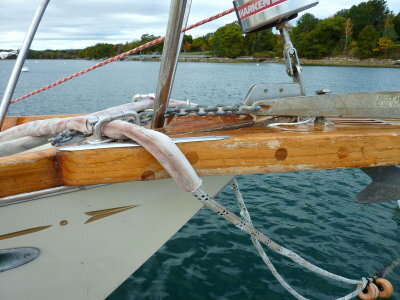 She was prepped for a haul out, hence the sloppy halyards, but the anchors were left on the sprit. 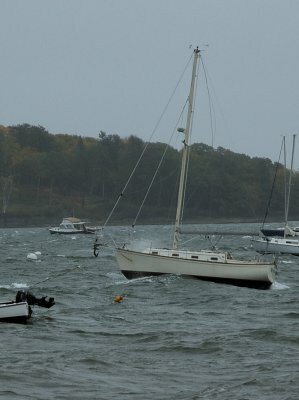 It was interesting to note that nearly 80% of the sailboats still in the water on 10-15-2010, in Falmouth, ME, HAD removed their anchors from the bows. To those who removed them a big THANK YOU! In this photo you can see the snapped pendant being blown against the port hull.. If you were to compare this image to the one with the bow sprit buried into the sea you can guesstimate the arc that the bow was rising and falling. Keep in mind that this was only 3-4 foot short period waves. When these photos were shot the wind & storm was winding down and perhaps only 30 knots. At the peak this storm hit 40-45 knots but only lasted a few hours. The bow of this boat is rising and falling perhaps 6-8 feet. Try to picture your vessels bow rising and falling 6-8 feet with an anchor on the bow... Ouch!! 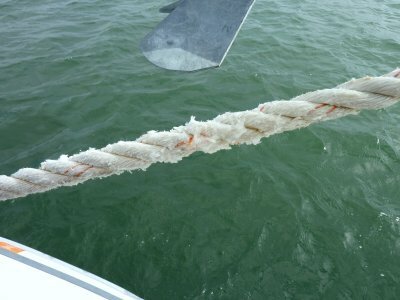 Please note the remaining pendant and how it is caught and held by the Delta anchor so tightly that it is bending the pendant and keeping it from straightening out. 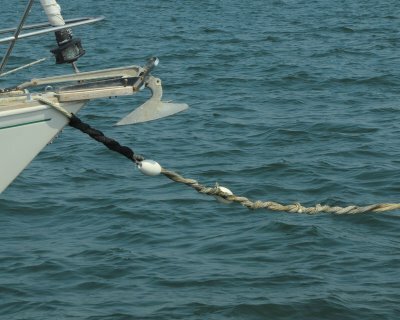 In this picture it is easy to see how the pendant could have grabbed the Delta anchor and ripped it free from the bow during the pitching moments. We already saw the photos of the bow under water I had to catch this one before it went below a wave to show how the anchor and pendant can become tangled. After the storm I made my way out to the Island Packet in the dingy. I wanted to see what Impact the bob-stay had on the remaining pendant and what caused the anchor to come free. Island Packet used rod rigging so there was almost zero chafe on the bob-stay as seen in this picture. This is what the remaining pendant looked like after the storm. If the storm had lasted much longer this pendant surely would have seen the same fate as the one that parted from chafing on the anchor. I shot this photo to show what friction heat does to a pendant. The flat glossy area is heat melt. It feels the same as if you were to melt the line with a lighter or hot melt gun, hard and solid. It became hard solid plastic as opposed to individual strands. This type of heat damage from friction over a chock can also lead to premature failure but the anchor got this one before the chock did. This is a close up view of the Island Packet. Once out there it was easy to see why the anchor dropped. It had been held up by nothing more than a 1/4" bungee cord. I suspect that when the bow dove into a wave the sprit went below the angle of the pendants and the pendants went over the anchor thus hooking it. When the bow rose on the next wave the bungee could not compete against the forces and let the anchor go. The only thing holding it in place was a chain snag on the hawse pipe. The broken pendant lined up cleanly with the Delta anchor. If you look closely you'll see the bungee cord holding the CQR. The Delta had a similar one. This was the view of the remaining pendant when I got to this boat the next morning to view the failure mode. Another few hours of storm could have been really bad. I could not leave without placing the anchor back where it went. While not my boat I felt a little uncomfortable but asked myself what I would want someone to do for my boat. 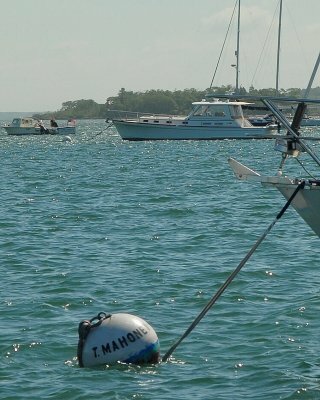 Unfortunately, I had no spare line to tie it off, and it was not my boat so did not want to go aboard and sleuth. I mentioned it to the guys at the local boat yard, and asked them to add a new pendant or notify the owner, but they seemed to care less. Hopefully they did call the owner. The boat in the distance with her stern to us, white spar and green sail cover is Orinoco. I was there shooting pictures but never saw her part her mooring, perhaps due to the visibility and how far out in the mooring field she is. I was using a polarizing filter which helped cut through the spray and rain. This picture is heavily cropped to zoom to this level. It did not look like this in real life! 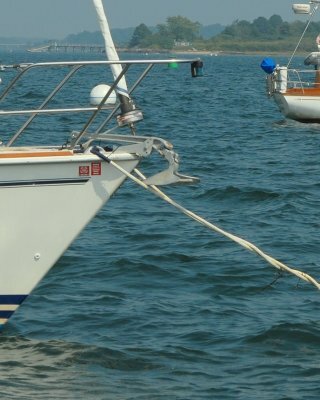 Thanks to a USCG mishap this boat was lost for many hours. They reported her adrift in an area she was not. 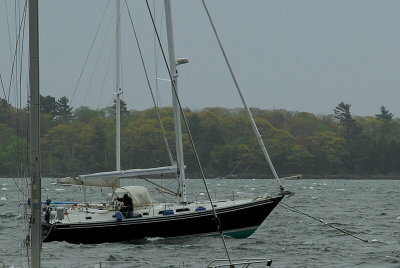 Her owner, after hours of scouring the shoreline, finally found her off of Portland, miles away. 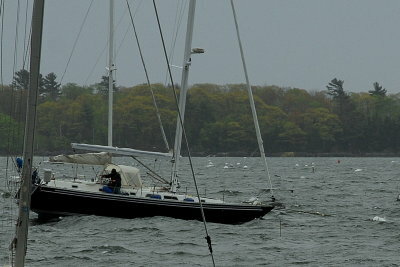 He was very lucky and she sustained almost no damage other than some keel scraping. This photo shows Orinoco not very far from where she was in the last picture but almost 20 minutes had passed. I suspect she tangled a string of lobster pots on her running gear, rudder or deep keel thus slowing her drift down. Click the image to make it bigger and you can just barely make her out. Here again you can see Orinoco drifting towards Portland at a slow rate of speed. Some of these photos were taken almost 30 minutes apart and with two different cameras. These are the bow chock ends of Orinoco's pendants. Note the chafe gear still in place, and munched, on one of them. I suspect the other one was lost to the sea. Good things can happen to well prepared people. Not only did these pendants suffer from chafe but they also had melted. Hard to tell which caused the failure melting or chafing but I suspect both played a roll. If you can it may be a good idea to watch your chocks and pendants interact when there is a blow. It may be a good indicator of how they will survive in a storm. These pendants would likely show virtually no signs of chafe until a storm, which for this owner, makes it tough to isolate what causes a failure. It should be noted that these three strand pendant were only about three weeks old at the time of failure. They both chafed & melted equally, and both apparently failed at near the same time, because they are equal length they will also chafe/melt equally as fast.. These pendants had plenty of length to keep a shallow angle over the chocks but they were no match for the cause of the chafe which I surmise was the sharp edges of the stem head fitting. 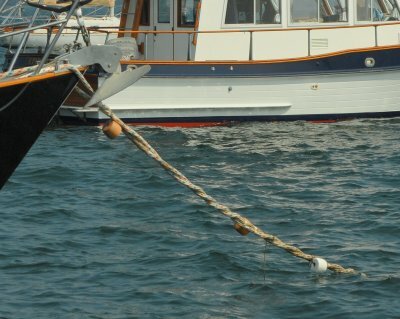 It should also be noted that this boat often suffers from the pendants wrapping the chain but this was not the case in this failure and they failed at the chocks. Sometimes design flaws don't show up until it is too late. 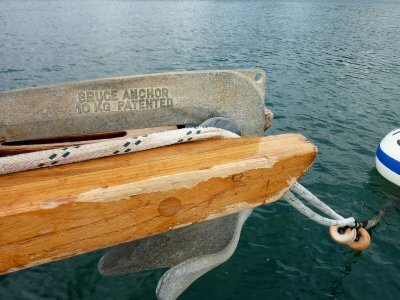 I am fairly certain that the designers of this anchor roller did not picture what would happen if the bow pitched into the water and a pendant got caught on top of it. Even with NO ANCHOR on it this anchor roller is a design that really needed some more thought. Another owner who got very lucky that he/she had two pendants and that this was a short duration storm. 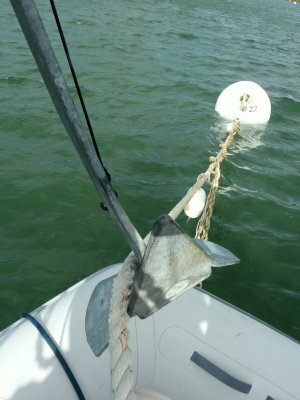 The bow of this Ericson plunged into the waves and picked up the pendant. 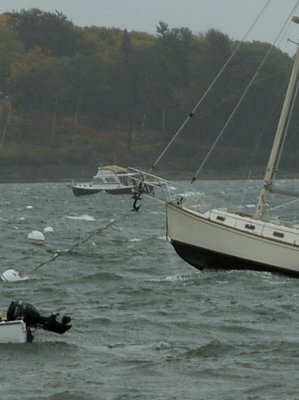 The poor design of the anchor roller with the high ears trapped the pendant there until the storm was over. There are so many places to chafe with the pendant caught here. While this pendant was already in rough shape age wise the sawing action of the anchor roller had chewed through 2/3 of it by the time I found it the next morning. It also had evidence of heat melt with notable hard melted masses. Before moving on I took it off the roller for the owner. The other pendant was in okay shape. Again watching the interaction of your pendants and bow chocks and appendages, during a blow, can come in handy. Using this photo as an example of how the pendant from the Ericson got where it was. Fairly self explanatory.. 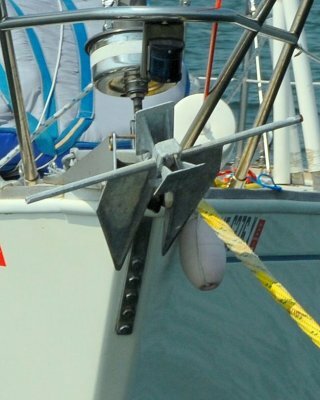 In this photo the bow of this SINGLE PENDANT Sabre is clearly chafing and impinging on the anchor and this was not an extreme example of pitching. Thankfully this was a short storm. Sometimes adding non-factory appendages can cause harm when you'd least expect it to. The bow of this Tartan 34 pitched into the sea and picked up both pendants thus breaking the beautiful and expensive teak bow sprit. The worn away varnish is a good example of how much pitching was going on before the pendants got caught in the roller and where the pendants had been rubbing. This is how the pendants are intended to ride. 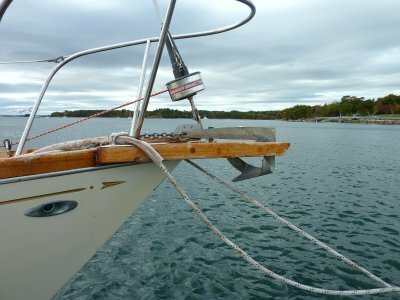 The owner has added well intended locking bow chocks, and used chafe gear, but I am certain never imagined the bow of this boat pitching through an arc of 6-8 feet and envisioned where the pendants might wind up. This pendant was on its way out due to anchor chafe. 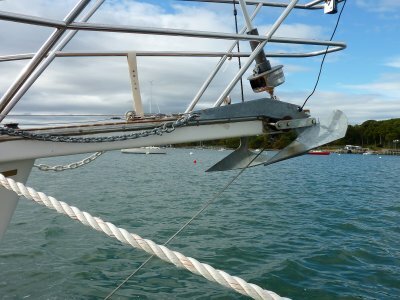 The act of the pendants jamming into the bow sprit probably stopped the chafing on this Bruce anchor. Sadly for this owner the beautiful teak platform is cracked and torqued downward about 3/4" to 1" from where it was originally mounted. Before leaving I placed the pendants where they should normally ride. The vessel in the foreground has pendants that could potentially fail earlier due to high frictional heat build up and increases in chafe potential from the sharp angle over the chock. The sharp bend these pendants are forced to endure, while riding over a bow chock, creates a hard loaded spot for heat to develop with little chance for relaxed moments or slight cooling periods. Heat can kill pendants, as well as chafe can. Respected institutions such as MIT have studied and written extensively about this. MIT has studied this at a rather in-depth level and found that pendants often fail from internal heat build up and may show little signs of chafe. Bending the pendant over a sharp radius can increase heat build up. Polyester is considerably less prone to chafe failure than nylon but both can fail if heated to melting. Yale Cordage, the makers of Yale Polydyne mooring pendants, are and were designed, with mooring specifically in mind. They feature a polyester jacket, built in woven chafe gear to allow cooling in high storm conditions, and a nylon core is used to allow for shock absorbency and to reduce shock loading to deck gear. They are the longest lasting mooring pendants I have ever used and each one has a serial number. While not immune to chafe or heat issues these pendants are well designed and built to take the abuse. The bottom line of the MIT study is that straight nylon pendants can fail earlier than polyester. Ask your mooring installer for a polyester/nylon double braided pendant or what options are available. Alternatively you can make yourself a polyester or Spectra bridle that you attach to your nylon pendants in a storm. 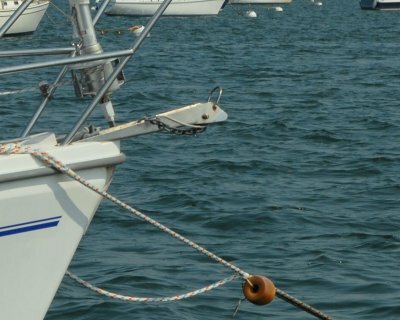 The longer length of the pendants on the boat in the distance puts less stress on the pendant over the chocks, during pitching moments, and creates less potential for heat and chafe. Any chance you have to reduce sharp bends in pendants the better off they will be over the long haul. On my own vessels I have had both long and shorter lengths and the shorter ones always encountered significantly more wear and had to be retired earlier than the longer ones. 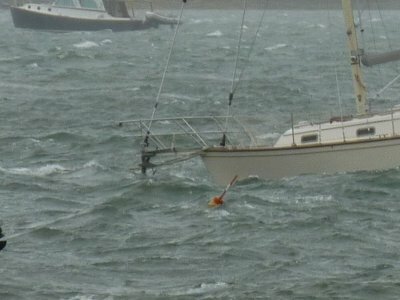 Shock loading is another concern and this photo is a good example of what happens when most of the caternary is removed due to storm loading and the mooring rode is snapped near bar tight. Despite the heavy mooring chain, minimum of 1/2" for top chain in Falmouth, the cleats are likely taking a massive load here. 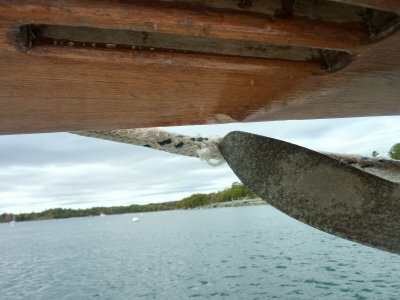 Make sure your bow cleats are well backed and that the decks are sound in the vicinity of the bow cleats. 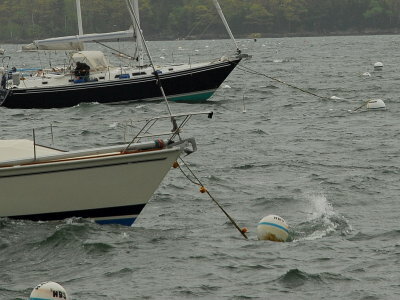 Yet another example of how pitching can cause the pendant and anchor to interfere with each other or get snagged on bow sprit or anchor roller. Here is a significantly longer vessel only in less wind and wave height. 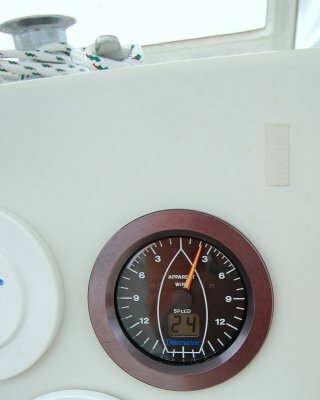 This was just some spring wind in the 20-25 knot vicinity back in 2009. You can still see the potential impact of the anchor. 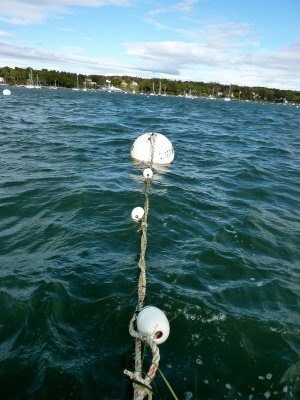 With any more wave height it would be easy for the pendants to reach over the anchor and snag it or get tangled in it and chafe. 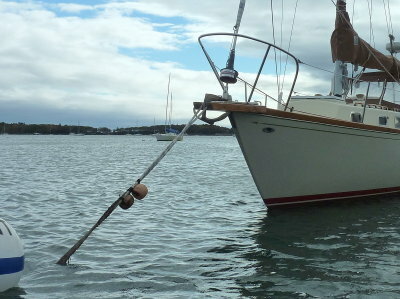 This owner understands that his/her anchor could impact the mooring pendants and has tied it up out of the way. 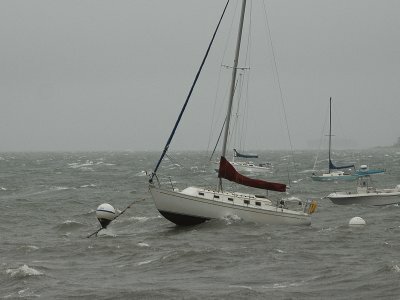 In a severe storm however the pitching of the bow may still catch a pendant behind the anchor. 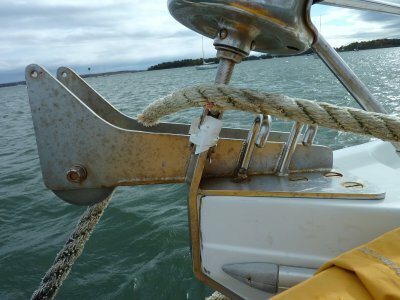 This anchor impinges on the pendant even in flat calm conditions. Picture this bow rising and falling 6-8 feet from peak to trough. 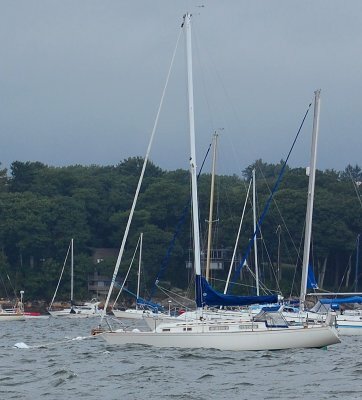 This anchor is interfering with the pendants in 6 knots of wind, imagine 45-50 knots and the bow rising and falling through an arc of 6-8 feet.. 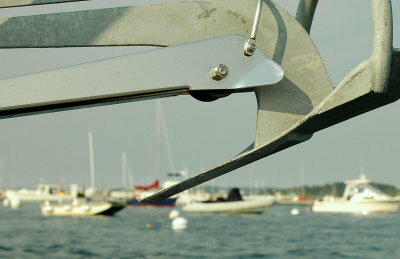 The town of Falmouth mandates top swivels be used but some installers still do not use them. "Each mooring must have one (1) top swivel; all swivels and shackles must be to the appropriate size diameter." 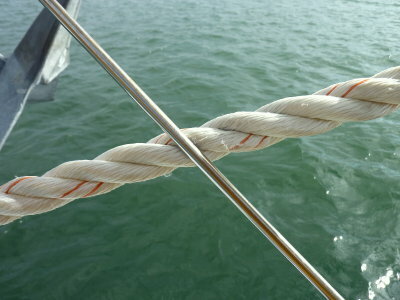 As the boat swings around the mooring, with wind and tide shifts, the chain twists and as a result, it shortens. This chain has shortened so much that the ball is being sucked under water. 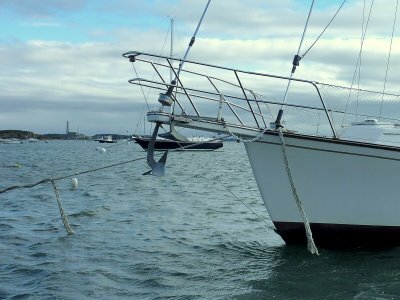 Short scope with minimal ability to retain caternary, especially in a storm, can literally lift the mushroom or granite block out of the bottom and the boat can begin to drag through the mooring field. It also makes shock loading of the hardware more likely with little to no caternary present. While swivels are and can be a high wear item they can also easily be over-sized to compensate for wear. I use a 1" swivel on my own mooring and regularly get 4-5 years out of them. They have always out lasted my 3/4" top chain. They are also available in 1 1/4" and 1 1/2" for larger vessels. Hamilton Marine sells them in these sizes. Are they expensive in that size, sure, but a LOT less than the hull deductible for my vessel. My 1" swivel costs about $100.00 far less than totaling my boat.. This is yet another example of what not to do. 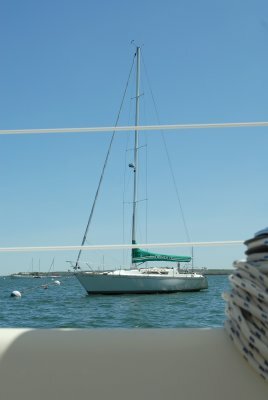 This boat is using no chafe gear and the CQR anchor is rubbing it in flat calm conditions. Picture this in a storm. These dual pendants will have a tough time fighting that CQR in a storm, and I would guess the pendants would lose.. This owner seems to recognize that the anchor is an issue so apparently slid the chafe gear down the pendants instead of having chafe protection over the chocks. This is a band aid at best that may only buy some time in a short duration storm. This is an example of an above ball attachment that has become tangled and wrapped around the chain below the ball. Floats have been used to try and prevent this from happening but do not. 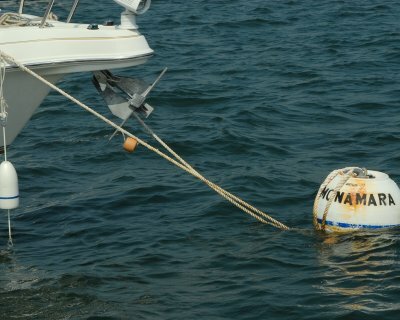 The problem here lies with where the "waist" or "equator" of the mooring ball sits or floats in the water. 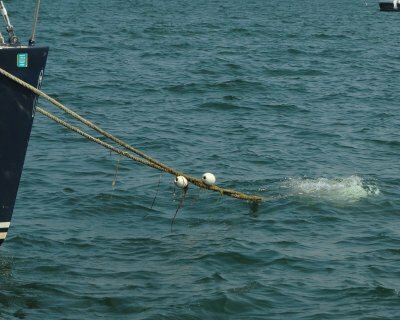 If the waist/equator is ABOVE the water, as this one is, the pendants can very often wrap the ball in calm weather, then as the wind picks up they will be sucked down the round curvature of the ball and into the chain, floats or not. If you have a top ball connection the ball should ideally be sized to float just BELOW the equator or waist of it at low tide. With the equator of the ball below water the floats on the pendants have a much better chance of riding up and over the ball as opposed to under it and into the chain. If a storm were to come up and this pendant was wrapped in this manner there is a very high likelihood this boat would break free. This Manson Supreme anchor has a knife sharp fluke. While with a CQR you may have some time due to the softer edges you'll likely get little wiggle room with a Manson Supreme.. Here's a close up. Do you really think your pendants will win the battle with a Manson Supreme anchor...?? These pendants are already showing signs of wear and tear from the anchor.. 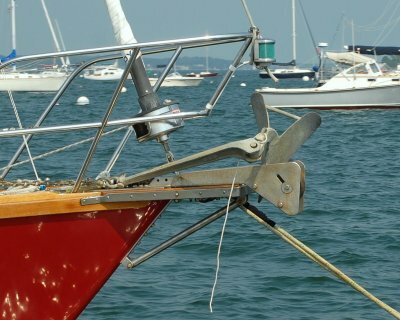 The owner of this Catalina recognizes the potential problems associated with leaving an anchor on the bow and has pulled it off the roller. 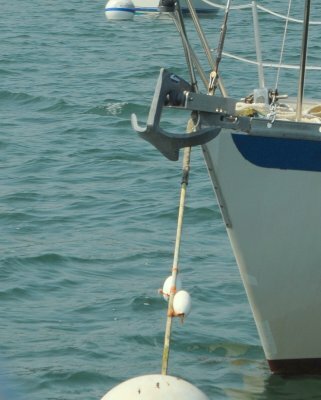 While this method may work in 2-3 footers it may not prevent the pendants from grabbing the anchor in 3-6 footers when the bow it pitching up and down wildly. 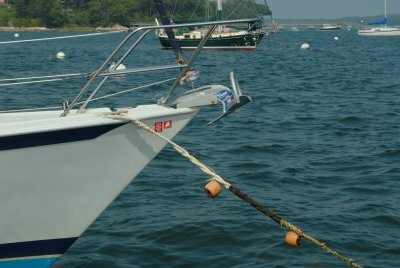 This boat has ball wrap but also the chain bob-stay could be a potential point for chafe, as could the two anchors on the sprit. This boater will surely need to consider something more robust as pendants other than rope to deal with that chain bob-stay in a storm. 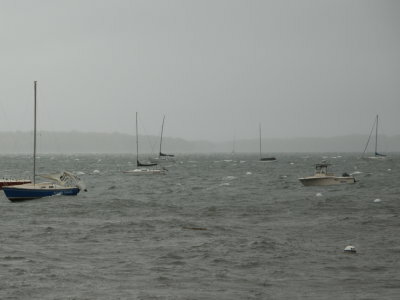 I feel very uncomfortable being down wind of this boat in a storm..
Falmouth Maine has a very large boat population, roughly 1200 moorings. 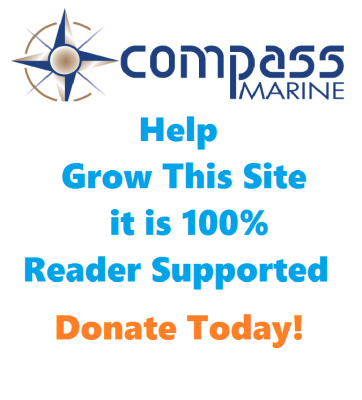 Even one boat breaking free can cause tens of thousands of dollars in damage to other boats as it smashes through the mooring field with no one at the helm. We are fortunate enough to have two moorings. 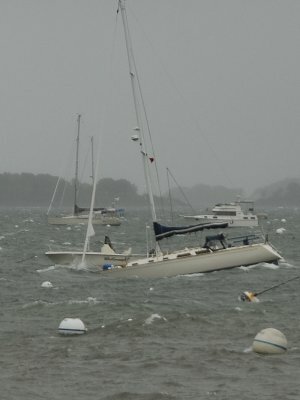 This is our storm mooring out in front of the house. 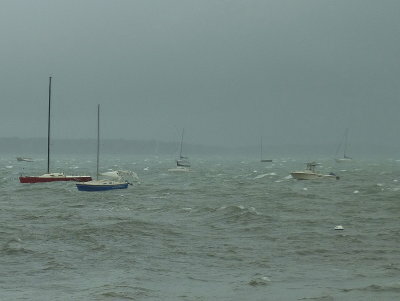 She is the furthest boat out to the prevailing storm winds. 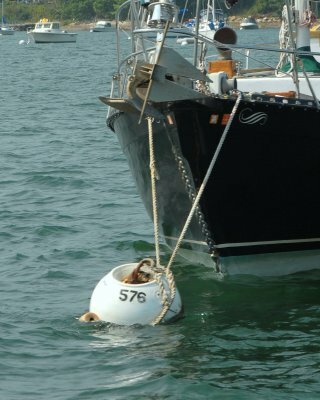 The mooring itself is nearly 9500 pounds of Maine granite. We use 30' of USCG / US Navy surplus stud-link bottom chain, read: MASSIVE and heavy, about 27 pounds per foot, and 35' of 1" Acco Long Link top chain. At the top, below the ball we use a 1.25" Campbell eye to eye swivel, as well as dual 1" X 20' and X 25' Maxi-Moor II pendants using Chafe Pro chafe guards. 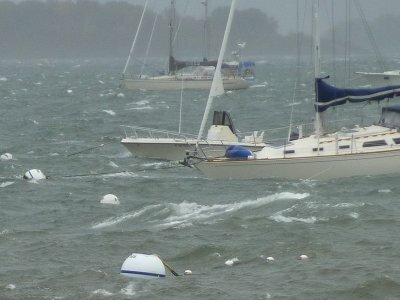 For bad storms (over 50 knots) we add dual 1" Dyneema storm pendants plus a third safety polydyne.. She rides out even the worst storms here with ease being better protected than Falmouth and with no boats to drag into us. In 2008 I was on-board when a thunder storm went through the anchorage. 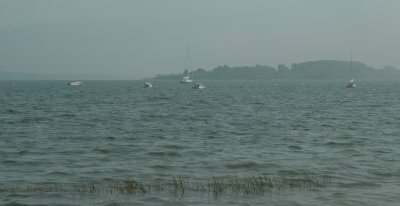 The winds went from 2-3 knots to about 20-25 for about 30 minutes. In just 30 minutes the waves built to about 2-3 feet. 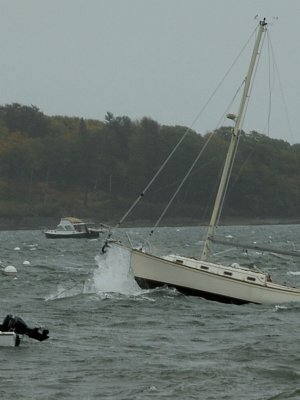 This is my neighbors boat in just 25 knots after less than 10 minutes of wind. 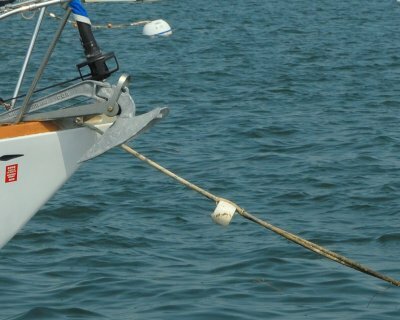 Notice the location of the pendants and the Bruce anchor on the bow. This was only a small short duration storm with max winds of 25 knots and the Bruce and pendants are already in contact with each other. This is a peak gust during that storm from the previous two images. Not only can this cause severe wear of the pendant on the chain & shackles but it creates short pendants which have sharp radius bends over the chocks which can lead to or cause earlier pendant failure. 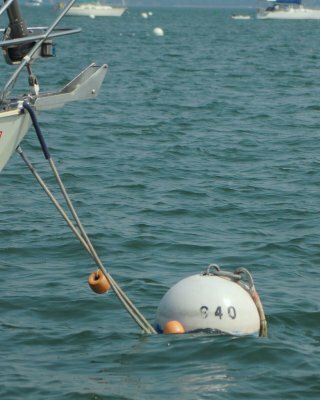 This mooring pendant appeared to be brand new that season and evidenced virtually no growth below the water At the point this photo was taken we had not yet had any significant wave or wind in the mooring field. This pendant had clearly been chafing and wearing on the anchor. With only one pendant, that had this much wear in mostly benign conditions, could be cause for trouble come bad weather.